First, cut them into useable sizes and shapes. Begin with the biggest pieces you have. Decide how to cut those scraps. The best size for cutting strips is beginning from the selvedge and across the fabric width. Cut strips 1 ½ inches, 2 inches, and 2 ½ inches wide. You can use these strips in Rail Fence and Log Cabin blocks. You can also choose to cut them into rectangles or squares for Chevron, 4-patch, or 9-patch blocks. Then, sort by size and color. 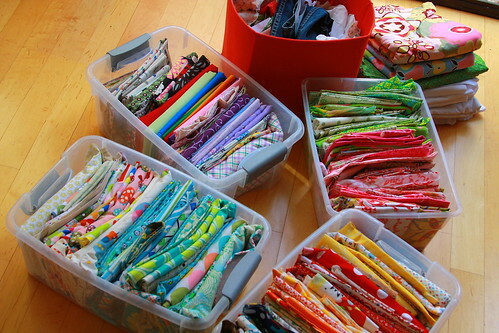 Start organizing your fabric scrap collection by sorting them by size. You can initially sort them in three categories: small, smaller smallest. Then sort them in subgroups by color. But if you are mainly a quilter and rarely quilt using a specific color, it would be best NOT to sort your scraps in color, otherwise you’ll have to sort through too many boxes or baskets for the size you need. Perhaps the top advantage of keeping your fabric leftovers neat and pressed is the time you save because you do not need to search through tangled and wrinkled pieces each time you’ll start on a project. You simply have to pick up the pieces you like and start sewing! 1. Keep them in clear boxes or baskets. Clear boxes are best, as they enable you to quickly see the size and color of the scraps inside. If you prefer to use baskets or bins, it will help if you label them. 2. Keep your fabric scraps covered. If your scrap collection is not properly stored, their bright colors will fade and it will collect dust. Whenever possible, store them in boxes, baskets, or other containers with lids, covers, or seal. If you keep them on a shelf, make sure they are not near your window. You can place a sheet of fabric covering over your shelf when you are not working on a project. This will help keep dust off your scraps. 3. Use mason jars. Fill each jar with a particular color of scraps (or by type, such as fussy cuts or novelty pieces), and add the lid so that nothing spills out. 4. Use the scraps so you can store them. Piece your scraps together to make a patchwork piece of fabric, and then sew that fabric into a storage basket or bucket to hold more scraps. 5. Arrange scraps by color or type in large zippered plastic bags (the kind you can buy to store sweaters or bedding). Then put these bags into a storage tote to protect them from sunlight. 6. Get a cart with small plastic drawers built into it. Fill each drawer with one particular color of scraps. 7. Use a repurposed dresser as a fabric storage system. If the drawers are too large, use cardboard to divide them into sections and put one color in each section. 8. Use a shoe organizer – the kind with several pockets that is meant to hang on a wall or over a door. Fill each pocket with scraps. 9. 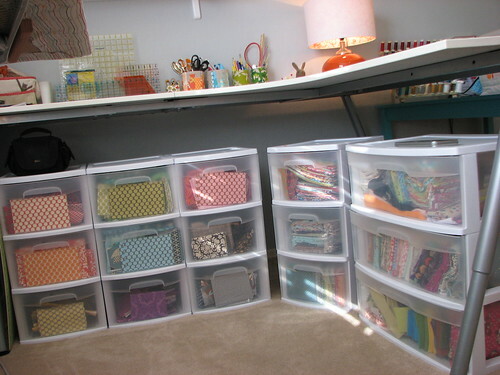 Under the bed – use under-the-bed storage boxes to house your scraps. Your spouse will never notice ’em down there! 10. Stackable baskets – Purchase stackable baskets at an office supply center. Fill each one with scraps and store them on top of one another to save space. 11. Fill wire baskets with assorted fabric scraps. Instead of dumping out the entire basket, you can grab just the right piece through the opening. These are from my studio but you purchase similar ones here on line. The key is – once your storage system or container starts to get full, it’s time to find a project for those scraps! 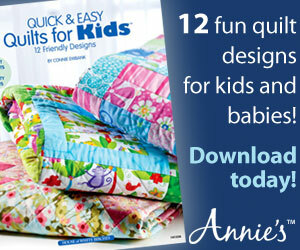 You’re in luck, because for National Sewing Month we’ll be talking about that all month-long. 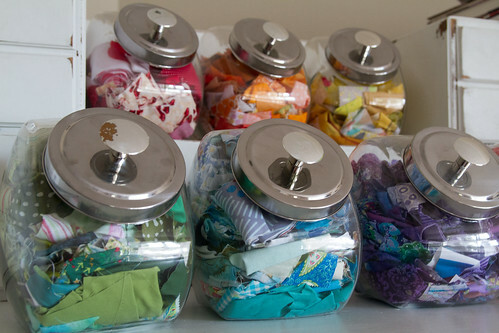 Do you have a favorite tip for wrangling your scrap stash? Share it with us in the comments, and then come back next time for tips & projects that will help you use up those scraps! **Disclosure: Please note that this post may contain affiliate links to products I own, use and love. If you purchase something through one of those links I may receive a small commission, probably to support my need for fabric. My scraps get out of hand sometimes! I am currently pressing and cutting into usable sizes. Then I store in plastic bins by size. All the 1.5″squares in one bin, all the 2, 2.5″ squares in a bin. The strips by size in a bin. I have about 10 sizes I save. Currently working on a Scrap Happy Little Wishes star block quilt challenge from Pat Sloan. It requires 2.5, 3.5 and 4″ squares. More details on my blog. Thoroughly enjoyed this for it can be used for all kinds of art mediums. Your ideas are wonderful. I sew alot of Barbie clothes and donate them to women’s shelters. I know i’ll be organizing my scraps now and getting through them so much faster.Thanks. I store my scraps (and I have a LOT of them) in the plastic tubs that cat litter comes in (from Sams)–I have them by size, starting at 2 1/2 inches and up to 6 inches -I have them stacked on a couple of open shelving units. I cut them the largest possible size I can get from the scrap, and usually in strips, thinking I can do them as squares or rectangles when needed. Larger pieces I also store in the cat litter buckets, by color; if its a kid print, that has its bucket too. This makes it easy to find what I want for a project. The larger pieces ( a yard and over) are on poster board (from the Dollar store), in 2 large cabinets (from Lowes) by color. I have them stacked like books on a library shelf, making it easy to pull out the one I want without disturbing the other pieces. This works for me !